Bless'ed Are The Meek dress (on sale!). 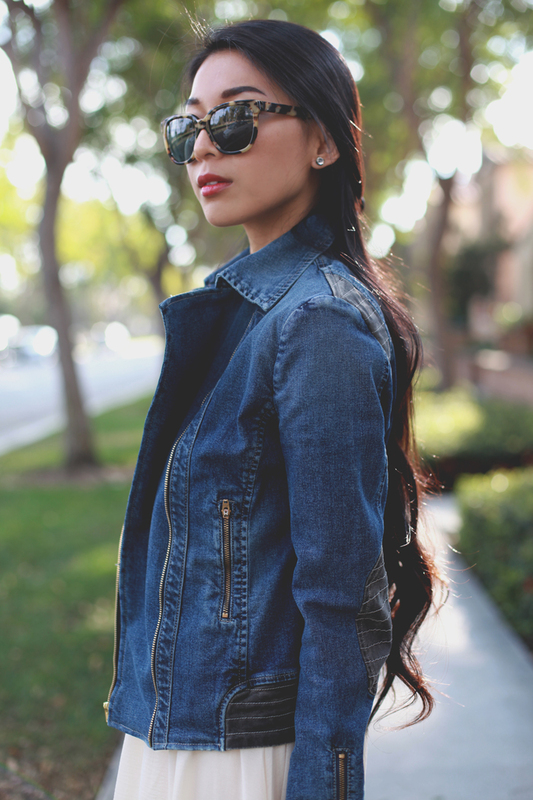 James Jeans jacket (20% off: JJMYLOVE2014). Warby Parker sunglasses. Herve Leger heels. Nixon watch. Chloe + Isabel earrings. YSL lips. I wore this beautiful, chiffon Bless'ed Are The Meek dress for a transfixing, wind-blown silhouette that forms with every power stomp. It's so nice to get back into an airy kind of wardrobe while the warmth is slowly creeping back into SoCal. It's also nice because I haven't had the chance to really dress up for myself this week - I turned to secondary mom status while my brother stayed home the entire week from school, sick from bronchitis. There's no inclination to take care of a sneezing, coughing child in anything other than sweats and jersey tees. Oh how I salute the moms that can actually do their hair and dress up beautiful on the daily! Bless'ed Are The Meek have some amazing floaty pieces. Hope your brother gets better! Lovely and lovable fashion. I love such graceful dressing for me. I need your help for write an essay for me and learning skills for professional writing. Thanks for sharing such useful information here.Our essay services will make you absolutely satisfied with our professional services!